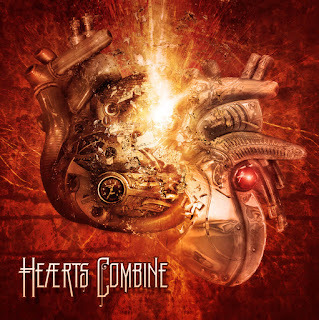 The industrial scene is connecting talents and combining hearts on a series of beneﬁt events and this release. "Heaerts Combine" is an international compilation of 25 bands representing EBM in all its varieties. An initiative of Tom Shear (Assemblage 23) and Michelle Molitor (longtime associate), the goal for these worldwide events and "Heaerts Combine" is to raise money for living and medical expenses for industrial/EBM legend Claus Larsen (Leaether Strip, Klutae, Am Tierpark, Mirland/Larsen, the Stricken) and his husband Kurt Grünewald Hansen, who unfortunately is very sick, making it difﬁcult for the couple to earn their living through touring. All proceeds from the sale of this beneﬁt the couple directly, and all of the bands included have donated their time and talent to the cause. "Claus Larsen and Kurt Grünewald Hansen have been a long time friends of myself and everyone in the electronic music scene. Based on an original idea by Jonathan Kaplan (For All The Emptiness) tracks were compiled by John R. Mirland (LÆBEL, Am Tierpark, Mirland/Larsen, Mirland) and Troy Hilton (DSOL Productions) with artwork arranged by Jonathan Kaplan and mastering provided by Sebastian Komor (Komor Commando). The compilations impressive track list includes names such as Die Krupps, Psyche feat. Dirk Ivens, SKOLD, Mortiis and many more. All were asked to deliver an exclusive track making this compilation a must for collectors. All proﬁts go directly to Claus Larsen and Kurt Grünewald Hansen. 15. Forma Tadre - Here we are again!